Years ago when I first started to get serious about selling on eBay, I scoured the internet in search of wholesalers to source products from. I bought some of those $1 lists on eBay that claim to give you over 1,000 drop shippers and wholesalers. For those of you that aren’t familiar with them, Worldwide Brands is a directory of wholesalers and drop shippers. Their major selling point is that they have “Light Bulk Wholesalers”. Light bulk wholesalers are companies that don’t require buyers to purchase large quantities to get better pricing. They typically have minimum purchases of $150. 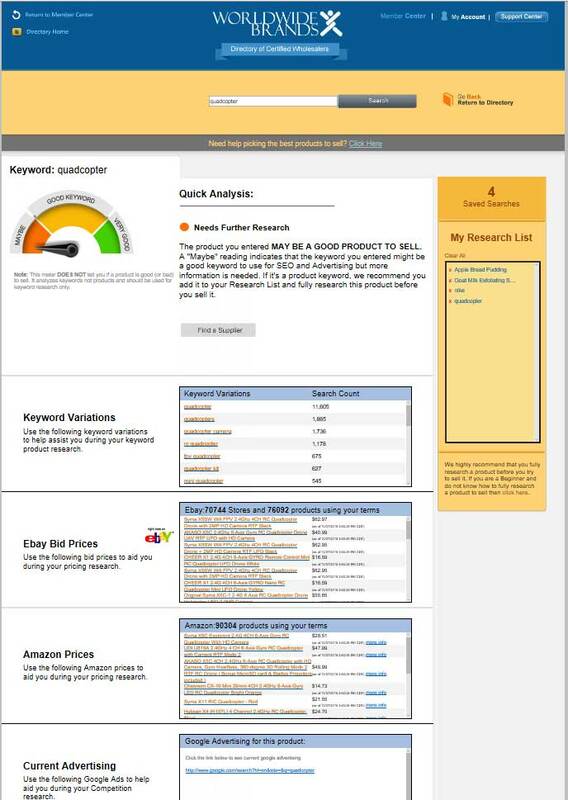 In addition to this, they claim to give you access to resources, tools, and training to help your eBay career take off. The price for all of this? $300. I was convinced that this membership was exactly what I needed. Being a student, I didn’t have thousands to sink into products, so the ability to buy in smaller quantities and still get wholesale prices is what intrigued me the most and is what likely will draw you in too. But is it really worth $300? In my opinion, no. Call me greedy, but for $300 I expect a lot more than just a search directory. WWB does deliver a lot more than just the directory, but it’s not free. They upsell like GoDaddy. They try to sell you on coaching, books, and other products after you sign up. Want help figuring out what to sell? They direct you to Sell-Niches.com which is an affiliate of one of the owners of WWB, Chris Malta. They also get a commission when you sign up for Sell-Niches which is yet another income stream for them. Need help getting your accounting stuff in order? They direct you to their affiliate link for Quickbooks. Then you have the pleasure of receiving emails to promote their coaching and other products regularly. I completely understand that they’re in it to make money, but for a $300 price tag I expect at least some genuine, free resources for their members that can’t be found with a quick Google search. Even the few videos they give you don’t have much useful information in them. If you sign up for WWB, expect to be marketed to on a continuous basis both on their site and with emails. Honestly, I have my doubts about exactly how much work they put into finding all of the companies in their directory. A lot of the companies could be found with a Google search. Most of the companies in their directory are branded companies. So you won’t be getting any generic products here. The problem is that the brands aren’t well known. I would compare it to being an Amway Global seller. You’re selling relatively unknown brands for the companies. There are some more well known brands in their directory as well, but a majority will be companies that you have never heard of. It’s not all bad though. WWB does deliver exactly what they promise. There are plenty of legitimate wholesalers in their directory and they will give you a discount assuming you have a Tax ID. But in order to get a deep discount (what I would consider actual wholesale prices), you will have to buy in larger quantities. There’s no way around it. Buying $150 worth of product will not get you anywhere near the pricing that ordering $5K or $10K worth of products will. This is something that WWB has no control over and something that they won’t tell you. They have absolutely no control over what kind of pricing you’ll get when you buy in light bulk. With eBay and PayPal fees plus shipping, it will be extremely difficult to make a profit on your sales unless you’re buying in large quantities. I’ll give you an example. I found one company selling Bobble heads, T-Shirts, toys, and other products in the Pop-Culture niche. The pricing that the company was offering me was barely below what the items were selling for on eBay. This was for an order of under $1,000. I would have had to buy well over $5K worth of products to get any type of real discounts. This pretty much goes against everything WWB advertises. They say that the sellers in their directory are Light Bulk friendly. But the reality is that they have ZERO control over what these sellers charge buyers. The Supplier Search feature is broken down to 7 different tools. Suppliers, Analysis, Demand, Competition, Advertising, Auction Pricing, and Retail Pricing. 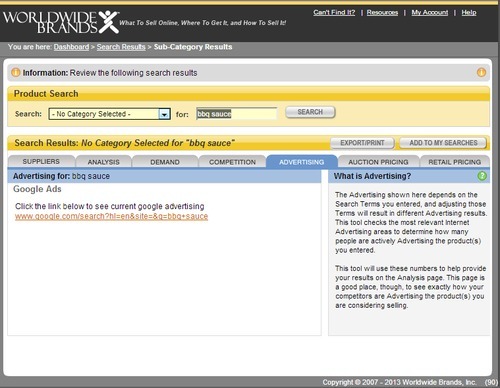 This is where you’ll see the search results for whatever product you’re looking for. 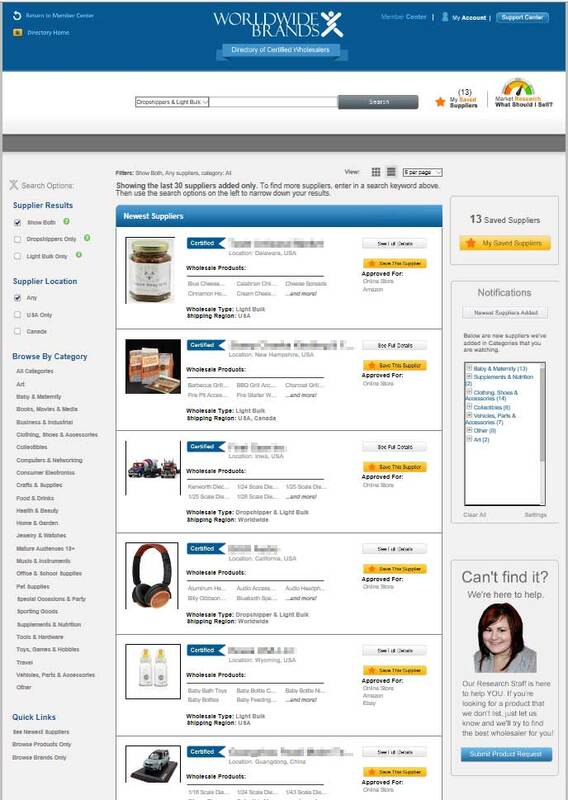 It shows the number of product types for Drop Shippers, light bulk wholesalers, etc. Next is the Analysis tool. It’s used to give you an idea of how difficult/easy it will be to sell the products you’re searching for. You can pretty much take this with a grain of salt. I’d advise you to do your own research instead of relying on this data. 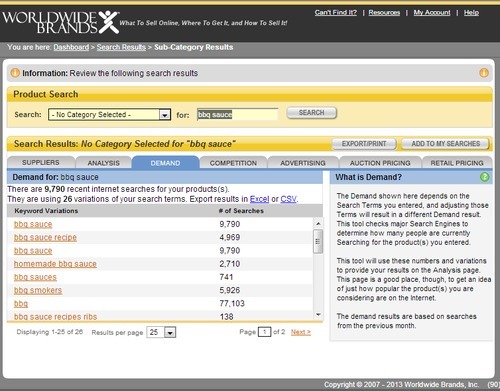 The demand tool shows you the number of searches the product gets per month. They also give you different keyword variations. This information is all available using the Google Keyword Tool to get this same info. 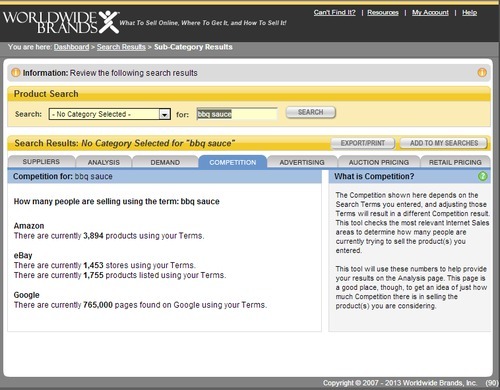 The competition tool searches Google, eBay, and Amazon for your phrase and displays the number of results for each. I really don’t see the point of this tool. It doesn’t give you any real idea as to what the competition for your product is. You have to perform your own research to identify your competitors. Just knowing how many pages contain the word “BBQ Sauce” isn’t really helpful. I actually have no idea what this tool even does. It just takes you to the Google search results page. Nothing too fancy (or useful) here. It just shows you the listings on eBay containing the word you searched for. As you can see, the results aren’t necessarily all relevant to what you search for. You would have to try and get really specific to get more useful data. And even still, actually going on eBay and searching by looking through Completed Listings will give you much more useful info. 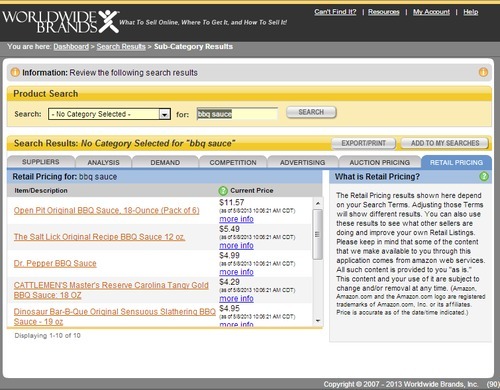 This tool does the same thing as the Auction Pricing tool except it searches Amazon instead of eBay. 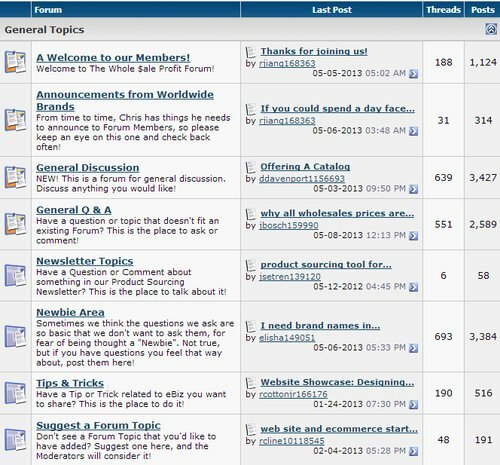 One of the “Bonuses” of the $300 membership is access to “experts” in their forum. This is a joke. The forum is dead. From what I’ve seen for the past 3+ years since I’ve been a member, there are about 10-20 new posts a month. A lot of the threads haven’t been posted in since 2012 or earlier. Compared to other paid forums, this is pathetic. Considering there is no real substance or value, the forum should be free for anyone to see. WWB is definitely a legitimate company/program. They aren’t scammers. But they inflate the value that they offer. They really don’t offer anything beyond the directory. Their free resources consist of telling you that you have to get your business legal (file an LLC, setup space to store your items, packing, etc. ), not to buy from fake wholesalers, find a niche to sell, and other basics that can be found online for free. Other than that, you have to sign up for coaching by Chris Malta, the founder of WWB or buy one of the products from their affiliates. My conclusion is that WWB isn’t worth anywhere near $300. It’s not even worth $100. I could see a price point of $20-$35 at the most. For beginners, I wouldn’t recommend it at all. You’re better off sourcing products at yard sales, auctions, Craigslist, or even Aliexpress. If you have a niche in mind, I would look for smaller manufacturers and contact them directly. WWB is basically just a middle man. 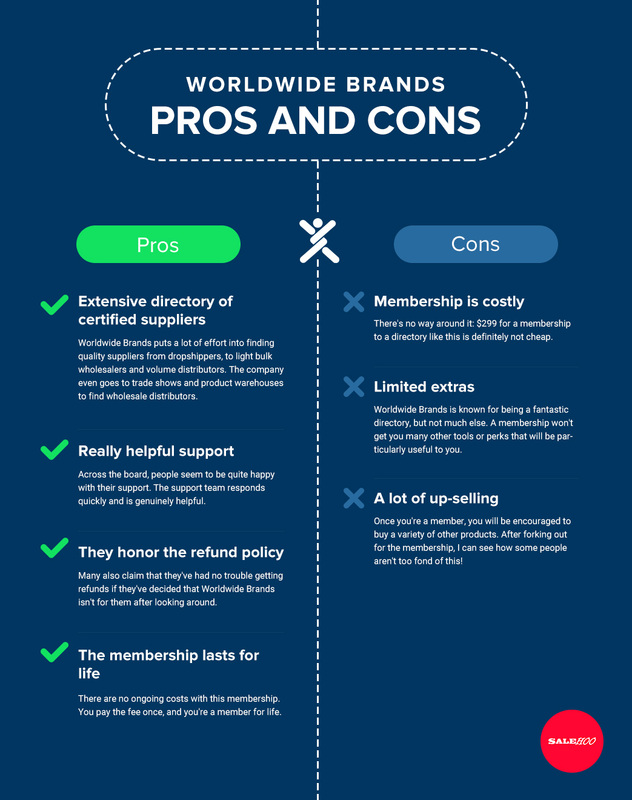 While there’s always a lot to consider about a directory like Worldwide Brands, there are a few major pros and cons that stand out. In this case, they revolve around Worldwide Brands providing a large directory, but at a large cost. I’ve gotten a ton of emails from people asking what they should use instead of Worldwide Brands. It’s taken me a while to try out a few different services and nail down what that I trust enough to recommend to you guys. But I found one I really like and have been using for around a year now– Salehoo. 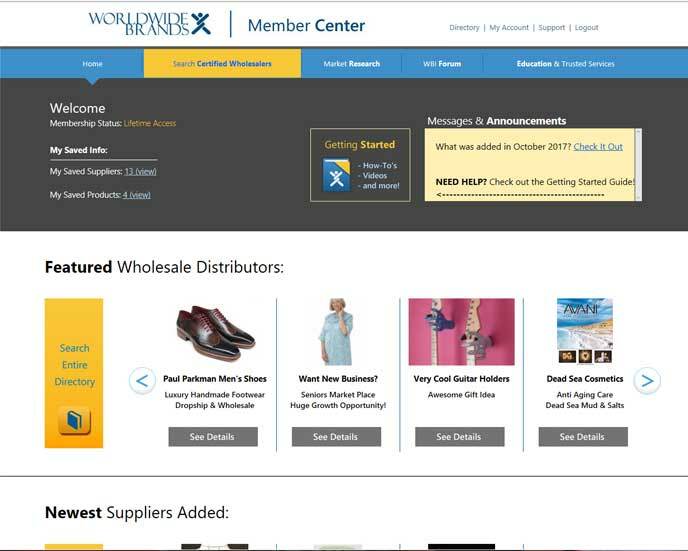 It’s similar to Worldwide Brands in that it’s a directory of wholesalers and dropshippers. However, you don’t have to pay $300 to join. Also, unlike WWB, you’re protected when you order so you don’t have to worry about getting scammed. As you can see I think Salehoo beats the WWB product over all and the team over there are constantly working to maintain and make the products better. Overall a better choice for the money, you can use the money you save to buy products and get to flipping them. The only way to make money online through eBay or elsewhere is to take action. Give Salehoo a shot and start sourcing some different products to flip to get the ball rolling. 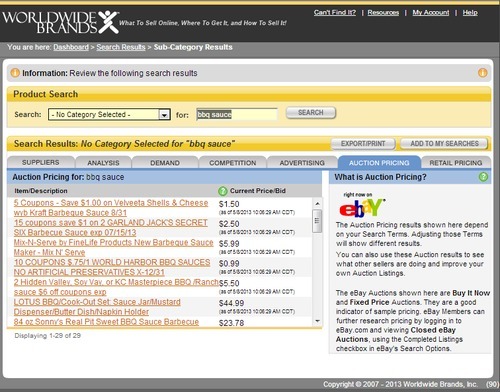 If you are an existing seller and looking to take your eBay selling to the next level, I highly recommend Online Selling Tactics, it is a huge resource for taking any seller to the next level of business, It also includes the Salehoo wholesale directory for an entire year. Best of luck to you in all you do..
Doba Review – Is Doba worth joining?